A fractal is a complex geometric figure made up of patterns that repeat themselves at smaller and smaller, or larger and larger, scales. In nature, they're found in fern leafs and corals. In this book, they're found in the pattern for a scarf, the cables of a pullover, and the intricate hemline of a skirt. The pentagon is a familiar five-sided figure that, in nature, can be spotted in the starfish or sand dollar; in this book it's spotted in the yoke of a pullover, the textures of a cardigan, and the shape of a shawl. In nature, water waves and chemical waves abound; in this book, they flow as the patterns in a hat and mittens and in the gores of a skirt. Knitting Nature is a singular book created by one of the most innovative and respected designers working today. Norah Gaughan, who got her degree from Brown in both biology and art, has combined her knowledge to compile this book of 39 fabulous designs inspired by patterns in nature. With each design, Gaughan first explains where in nature the pattern can be found, such as the spiral in a ram's horn or seashell; then with step-by-step instructions she shows how she rendered that pattern in a skirt or tunic or coat. Complete with exquisitely beautiful photographs, this sophisticated book is truly one of a kind. 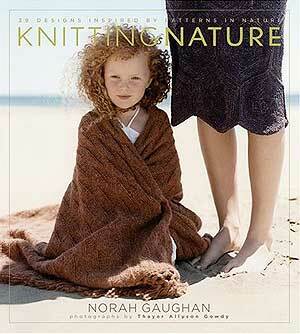 Named one of Vogue Knitting's Master Knitters of the 1990s, Norah Gaughan is the design director for Berroco Yarns. She has been working in the handknitting industry for more than 20 years and her designs have been featured in all of the major knitting periodicals as well as in many books, including Handknit Hoilidays and Weekend Knitting from STC. She divides her time between Peterborough, New Hampshire, and Providence, Rhode Island. Thayer Allyson Gowdy is a photographer based in Northern California whose work has appeared in the magazines Real Simple, Health, and Country Living, and in the books NEST: Home for Two, Spiritual Bathing, and Healthy Homes, among others.